I have an intense post coming up, but I am currently waiting to get feedback on it as I am still not 100% sure that it gets the point(s) across. I am back to square one again this week and I am not enjoying it all. Today I had another employment agency meeting which went well but led no where. I was asked if I had any back up jobs that I wouldn't mind doing and honestly I don't. I would love to be an author but that takes time and though I one day hope to be one I need money and security, web design is another thing I enjoy yet I don't have the training and my skills need developing. Administration is the only thing I have ever felt I could do, sure I have hobbies but none of them leave anywhere. Writing is the only hobby I can see leading me somewhere but not at the moment or any time soon. I know that the job market is tough but the thing is I have God on my side and I know if I trust him I will get the perfect job. Yesterday afternoon I put on Pitch Perfect (I can probably quote most of Fat Amy's lines haha) and made the building where I did work experience a card to say Thank You, it was the least I could do for them all. I honestly doubt they know how much they helped me and I felt that a bought card wouldn't do justice. 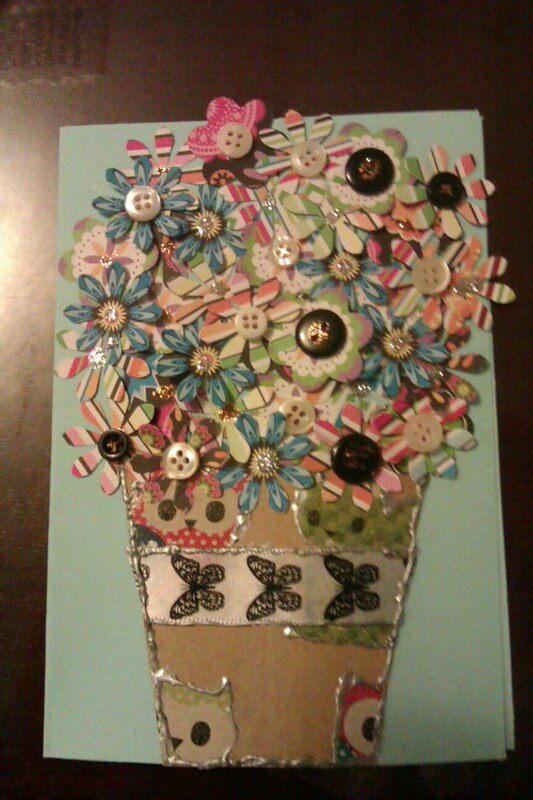 It turned out better than expected (amazing what some coloured paper, a few flower punches, some buttons, glitter and a scrap of ribbon can do!) 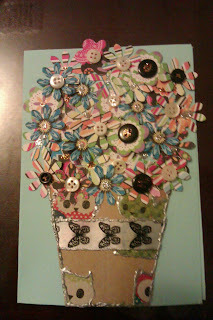 and I can't wait to make a few more cards like this one (might be able to use up most of paper scraps in my craft box). I am hoping the post will up by the end of the week, I am warning you guys it is intense but it needs to be out there.